The launch campaign is "one of the most extensive" the company has run to bring the phone's features to life. Samsung Canada is putting its full advertising might behind the debut of the new Galaxy S7 smartphone. The launch campaign is coming in multiple phases, with each one focusing on a different product feature. Ads highlighting the phone’s water and dirt resistance debuted last week with the S7′s launch, while ones highlighting the improved capabilities of the camera, the ability to take 360-degree videos with the Gear 360 camera, and a composite of performance features like expandable memory, a PC-quality gaming processor and a further-improved battery on the way. 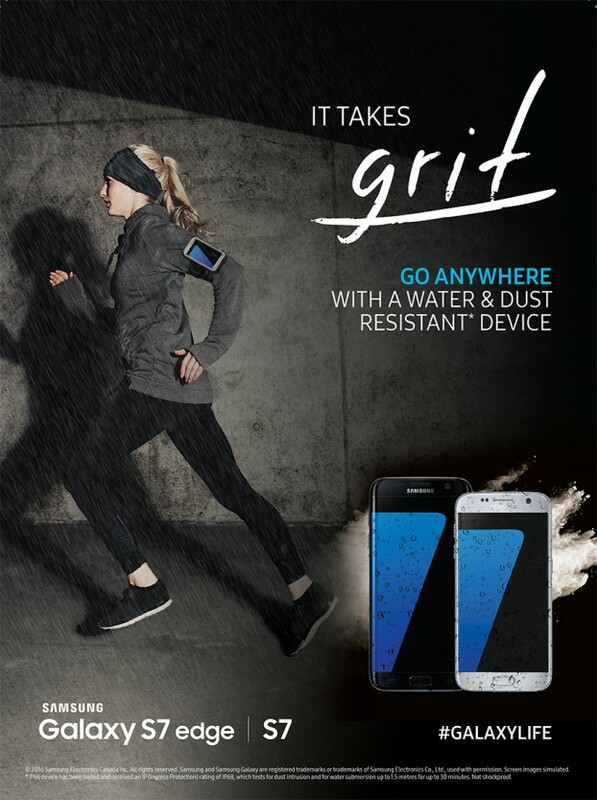 All the ads feature a “It Takes” headline, such as “It Takes Grit” for the water and dust resistance, or “It Takes Spontaneity” for the camera, to help the campaign take technical features and apply them to the everyday lives of consumers, a continuing marketing principle for Samsung within Canada. The company is taking a 360-degree approach to the S7 launch, running the ads in print, out-of-home, transit, online display and in-retail at its Experience Stores and partner retailers, as well as a social push featuring videos covering the full range of product features and TV ads launching today. Starcom handled the media buy, with Cheil Canada on creative, Mosaic on experiential and North Strategic handling influencer relations. Samsung is engaging influencers to create content and ensure the S7 launch has an authentic, non-brand voice to it. Childs adds that while “mobile millennials” continue to be a key target for Samsung, and that they drive the tone and method of the campaign, the fact is that everyone “lives through” their smartphone today means it will reach a broad audience.